The Hispanic population in Indiana ranks 21st in the nation.4 About 390,000 Hispanics reside in Indiana, 0.8% of all Hispanics in the United States. Indiana’s population is 6% Hispanic, ranking 30th in Hispanic population share nationally. There are 141,000 Hispanic eligible voters in Indiana—ranking 22nd in Hispanic eligible voter population nationally. California ranks first with 5.9 million. Some 3% of Indiana eligible voters are Hispanic, ranking 31st in Hispanic eligible voter share nationally. New Mexico ranks first with 39%. More than one-third (36%) of Hispanics in Indiana are eligible to vote, ranking Indiana 32nd nationwide in the share of the Hispanic population that is eligible to vote. By contrast, more than three-quarters (77%) of the state’s white population is eligible to vote. Age. More than one-third of Hispanic eligible voters in Indiana (36%) are ages 18 to 29, similar to the share of all Latino eligible voters nationwide (33%) in that age range. 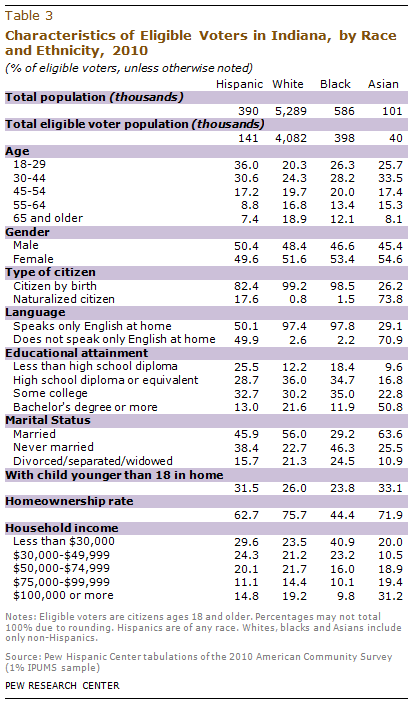 By contrast, only 22% of all Indiana eligible voters and of all U.S. eligible voters are ages 18 to 29. Citizenship and Nativity. Among Hispanic eligible voters in Indiana, 18% are naturalized U.S. citizens. This compares with 25% of Hispanic eligible voters in the U.S., but just 2% of all eligible voters in Indiana and 8% of eligible voters in the U.S overall. Hispanic Origin. 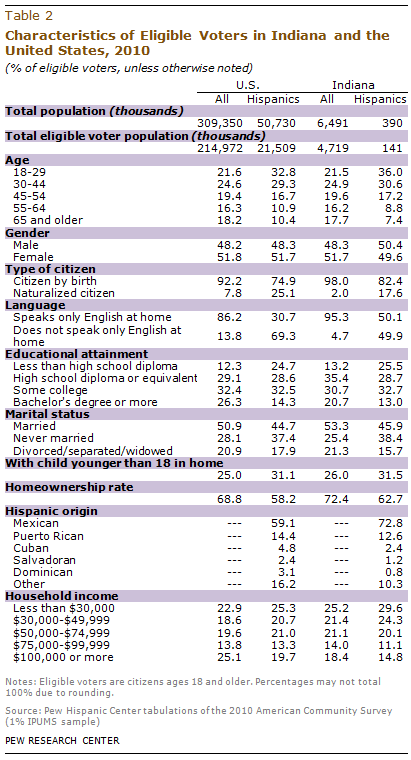 Hispanic eligible voters in Indiana have a different Hispanic origin profile from Hispanic eligible voters nationwide. Nearly three-quarters (73%) of Hispanic eligible voters in Indiana are of Mexican origin, 13% are of Puerto Rican origin, and 15% claim other Hispanic origin. Among all Hispanic eligible voters nationwide, six-in-ten (59%) are Mexican, a similar share are Puerto Rican (14%), and about a quarter (26%) are of some other Hispanic origin. Educational Attainment. One-quarter of Latino eligible voters in Indiana (26%) have not completed high school, double the 13% of all Indiana eligible voters who have not completed high school. Homeownership. More than six-in-ten Hispanic eligible voters in Indiana (63%) live in owner-occupied homes, slightly more than the share of all Hispanic eligible voters nationwide (58%). Greater shares of all eligible voters in Indiana (72%) and all eligible voters nationwide (69%) live in owner-occupied homes. Number of Eligible Voters. White eligible voters outnumber Hispanic eligible voters in Indiana by nearly 29 to 1, and black eligible voters outnumber Hispanics by nearly 3 to 1. Hispanic eligible voters outnumber Asian eligible voters by more than 3 to 1. Age. 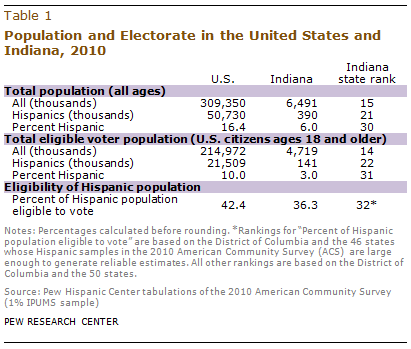 Latino eligible voters are younger than black, Asian and white eligible voters in Indiana. Some 36% of Latinos are ages 18 to 29, compared with 26% of black and Asian eligible voters and 20% of white eligible voters. Educational Attainment. Hispanic eligible voters have lower levels of high school education than do black, white and Asian eligible voters in Indiana. Some 26% of Hispanic eligible voters have not obtained a high school diploma, compared with 18% of black eligible voters, 12% of white eligible voters and 10% of Asian eligible voters. A similar share of Hispanic (13%) and black (12%) Indiana eligible voters have a bachelor’s degree or more, compared with 51% of Asians and 22% of whites. Homeownership. Hispanic eligible voters (63%) are more likely to live in owner-occupied homes than black (44%) eligible voters in Indiana, but they are less likely to do so than white (76%) or Asian (72%) eligible voters in Indiana.